For spurned writers, the agents who passed on their novel are easy targets for post‑factum ridicule. The rejection letter looms large, and it takes an even larger fellow to just…well, just get over it. I am one such fellow. No,…really. A concern for “commercial viability” was the deal-breaker that most often came my way when I was shopping AIIOE. It was usually festooned with earnest turns of phrases like these but-make-no-mistake-I’m-no-philistine excerpts from different agents: “You’re a terrific writer with a great voice…thoughtful, lovely, complex…full of beautiful writing, and powerful ideas…the rich details, the patient evocation of setting, the unique angle of the narrator…exceptionally well-written – hearteningly so, given the amount of decent-but-not-good prose that seems to come across my desk here…your formidable intellect and abilities will be as evident to anyone else who reads this as they were to me…well-crafted sentences and engaging characters…The characters come to life and take definite forms, while also feeling dynamic…yaddy yaddy yaddy.” (full disclosure: the last excerpt is mine, the rest…well, you know who you are). So, when I heard that the Fomite Press intended to nominate AIIOE for the prestigious Pushcart Prize, I nodded my august head with my usual seriousness of purpose…why yes, of course,…this novel is important, of course it should be recognized. 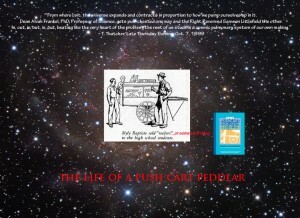 After all, like most writers, I have discovered that I and my ideas indeed DO occupy the center of the universe. In fact, clearly my writerly gravitas is essential to keeping Anti-Matter in check. Commercial viability…? Not when the cosmos is at stake. But the fact that those agents who’d read and passed on the manuscript could not see this was surely not their fault. They’re not to be blamed, no, not the poor squealing rabble whose necks are pinned under the literary hobnails of those referred to by the Pushcart Prize folks as the “oligarchs who pick our entertainments, our celebrities, our presidents and our wars.” …Ouch. Like grist mill donkeys harnessed to the Big Lit House Wheel, these poor dupes simply lack the élan vital that apparently animates me, the small press writer, or, for that matter, the Pushcart itself. They even say so: “Children of the spirit…for over three decades the Pushcart Prize – and the small presses and authors we honor – have flourished. The reason? (Simple, stupid). 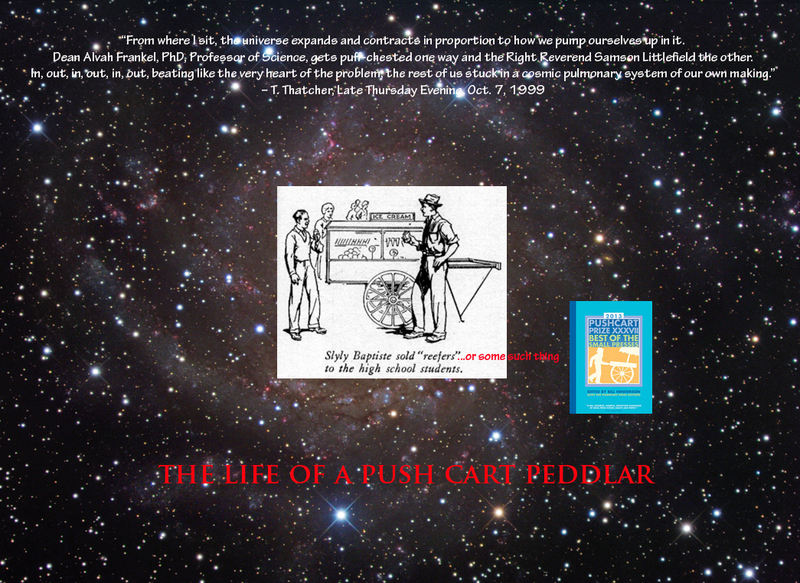 Spirit will never be quelled, certainly not by big bucks and bluster…” Whoa…you go!…Push that cart! Now, I’m just having a bit of fun here (…this is where I start my festooning). I certainly don’t want to screw my chances of either getting a piece of the Prize, or dodging a blackball by the AAR. In truth, I kinda like agents, and even puffed up a bit from the encomiums (whether they were just smoke being blown up you know where, or for real) adorning those dispiriting missives. And, furthermore,…a Pushcart Prize nomination! ?…are you effing kidding? Me?! I can only shake my head in wonderment and go back to my seat at the Center of the Universe. I’ve got some Black Holes to plug with rejection letters.